A few weeks ago we attended a series of author talks at Mary Who? bookshop in Flinders Mall. One of the presenters was Yvonne Cunningham and we came home with her book, Tropical Food Gardening (2013 edition; the first edition was 2012). After one page on “Getting started in the vegetable garden” (location, layout, bed construction, mulch, compost) the book begins a series of monthly activity guides: what to plant and how, what needs protection from pests, what will be ready to harvest, etc. Interspersed amongst these core articles are recipes using seasonal produce, and short features on particular plants, insects (beneficial and otherwise), companion planting and similar topics. Asian vegetables such as Kangkong, Tatsoi and Snake beans are introduced alongside the European equivalents which may be more familiar to most readers. The book’s structure results in some repetition (e.g. what to plant in August naturally has to be rather similar to what to plant in July) but all the information is clearly presented and very practical: the author is obviously the kind of person who is utterly at home in her veggie garden and probably happiest with her hands in the dirt. Yvonne’s current blog at http://coquettepointinnisfail.blogspot.com.au/ is full of great photos of the environment – birds and bugs as well as the plants you might have expected. It’s a successor to her blog at http://violets-and-lace.com/ (2009-11) which focused on her Innisfail garden centre and Coquette Point nursery. It wouldn’t surprise me, in fact, to find that many pages of her book originated on that blog, especially since the length of each article, between half a page and two pages, is about right for a blog post. 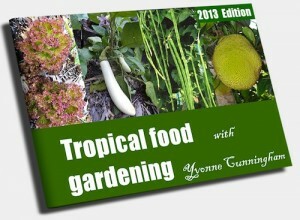 Tropical Food Gardening is self-published and shows some of the quirks typical of that process. The index, for instance, is inside the front cover and doubles as the table of contents, while the first page combines the functions of title page, copyright page and preface. The format is A4 in landscape orientation and the layout uses it flexibly: most of its 80 pages are in three columns but some are in two or four, especially where there are good photos to show off. The large, bright photos, in fact, are a strength of the book; so, too, is the lively use of colour in headings and text-boxes. Yvonne lives near Innisfail and her gardening recommendations centre, naturally enough, on the Wet Tropics, so some of her suggestions are not entirely valid for Townsville, which is much drier than the rest of the coast. That said, it’s still one of the very best food gardening books for us since there are so very few others that even know the tropics exist. • Leonie Norrington Tropical Food Gardens: a guide to growing fruit, herbs and vegetables in tropical and sub-tropical climates. Bloomings Books, Melbourne, 2001. 160pp. A beautiful book, well designed and full of lovely illustrations by Colwyn Campbell, it is narrower in focus than its subtitle claims, being all about gardening near Darwin but there’s still a great variety. Vivid descriptions of the extreme Top End seasons and what the wildlife will do to an unprotected garden, recollections of collecting bush tucker, etc, complement practical advice about growing fruit trees, vegetables and herbs. • Pedro O’Connor and Roger Goebel Tropical Tastes: fruits, foods and flavours of North Queensland. Department of Primary Industries and Fisheries, 2005. 60pp. I have yet to see this publication since I only became aware of its existence while writing this review, but it was highly commended in an informative review on the Rare Fruits Australia website. • Glenn Tankard Tropical Fruit: an Australian guide to growing and using exotic fruits. Viking O’Neil, 1990. 152pp. Half a dozen introductory pages are followed by descriptions of 50+ tropical fruits from Abiu to Sweetsop, each with cultivation, harvest and usage notes; the book is very good at what it does, but has only half a dozen pages of recipes and no coverage of vegetables. • Barbara Beckett Tropical Fruits: the Australian kitchen – buying, preparing and cooking. Barbara Beckett publishing, Sydney, 1995. 60pp. This book complements Tankard’s, with 15 pages on buying and preparing the fruits and 30 pages of recipes; it is attractively presented and has some nice recipes. In the course of researching this review I discovered a good range of online resources for tropical food gardeners but I will leave them for another time. Well this is a common mistake a lot of Rodale-informed gardeners make. The problem with dolomite is that it contains approx. 13% magnesium (and approx. 23-25% calcium). This isn’t a problem when you have magnesium deficiency but most gardens have plenty of Mg. This leads to a ‘tightening’ of the soil. In severe cases it can also inhibit the decomposition of organic matter. Adding dolomite to the soil without first understanding what the soil is doing is not going to do you any good. Play it safe and add lime instead. The carbonate will raise the pH and the Ca will assist the plant’s assimilation of nutrients. Both you and Yvonne know far more about soil chemistry than I do but I will just suggest that Yvonne’s idea of “constant rain” may be Ingham/Tully/Innisfail quantities, i.e. 1800 – 3600 mm per year which is far from typical even for the tropical coast – this map puts it in context. I’m not sure if that makes a difference to the soil treatment but I thought it might be worth mentioning. Yes the Tully/Innisfail/Ingham region has the second highest rainfall in Australia from memory (after Strahan in Tassie – but I could be wrong on that). If anything, the rainfall would make it even worse. Calcium (Ca) always ends up leaching out of topsoil and into subsoil. If you took tests of the soil at different levels, the highest Ca levels will typically be found lower down. The greater the rainfall the lower your Ca will be found. That is why in areas where Ca has migrated down you will find extremely deep-rooted plants such as dandelion. Their plants have a long taproot that can access the Ca layer and pull up the Ca. In fact you could pretty much go so far as to say that if you have a dandelion problem, you’re probably short on Ca. That is why I said that Dolomite is a big no-no in such a situation. Using dolomite will just tighten the soil, reducing air in the soil and lead to hydrophobic soil. The tough-as-nails type of soil that just keeps getting tighter. It is like throwing petrol on a fire… I don’t expect the average gardener to know this because unfortunately it isn’t spoken about in polite circles for some reason, but it does concern me that published gardeners espouse the old Dolomite line. I have even heard some respected gardeners on a popular ABC show tell viewers to use Dolomite and I just cringe. Now don’t get me wrong, we need Mg for chlorophyll production etc, but generally, our soils aren’t Mg deficient and we’re only making the situation worse. I came across another NQ book on tropical fruit, Know & Enjoy Tropical Fruit by James Darley, after writing this blog post and will have to write it up some day. Meanwhile, go to http://knowandenjoytropicalfruit.com/ for information and, if you like, buy it as hard copy or ebook from Google. Previous Previous post: The IPCC Fifth Assessment Report: what does it say?